It looks like my latest read The Life Changing Magic of Tidying by Marie Kondo, may be a book that will indeed change my life this year. I feel I maybe the last person to the party when it comes to reading this book, for the last year it has been popping up on my social media feeds. Having returned from holiday I received notification from my library that my book was ready for collection. I had forgotten all about The Life Changing Magic of Tidying book as I have been on the waiting list for 6 months. I thought Marie's style of writing a little repetitive at the beginning of the book. But in fact I think it is a way of preparing your mind to embrace letting go of items you may have kept for years. Within days I found myself looking at items around the house with a new attitude, yes they were what I wanted/needed during a certain point in my life and appreciate them for that but I do not need them now. They served a purpose and for that I am grateful, but they can now go. I realise that some items for example an ornament purely because I thought I would feel guilty for letting them go, that I had to keep them. But Marie Kondo has changed that approach, asking the simple question does it spark joy really did work. 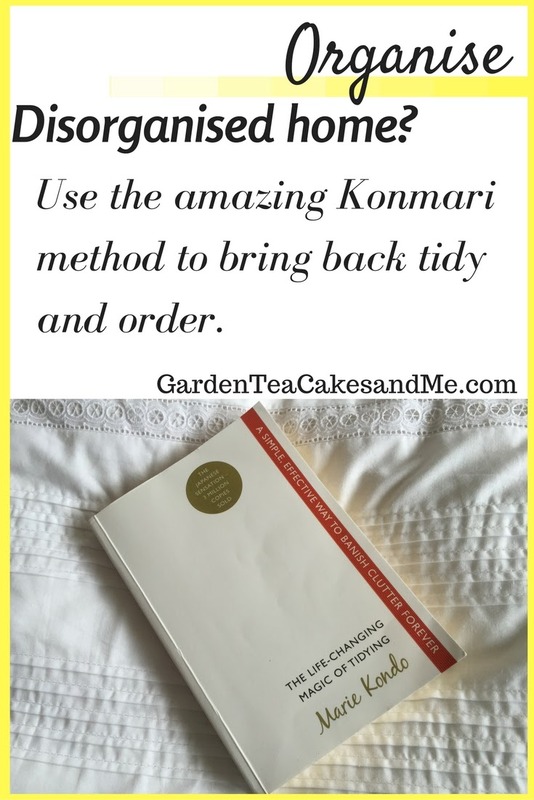 Marie recommends a certain order to decluttering your items, starting with cloths and finally those items with the most sentimental meaning to them photographs. Once decluttered you have less items to store and tidy away. She believes that everything you have should have a dedicated location, so you never again have to think about where to put everything, you also know immediately where it is and where it belongs. I have also changed how I store items, particularly clothes. Once you have read the book you will understand and totally appreciate why items should be placed so they are not stacked. Marie even describes a specific way items should be folded, do not worry if you can not follow it a quick Youtube search will find lots of demonstrations. My sock drawer if I do say so myself is a thing of organised beauty. I had early in the year decluttered my clothes, but having read this book I went back and I sent more clothes to the charity shop. I am 12 handbags lighter, and have them tidied now so I now know what I have. I still have so much more tidying to do, books are next. At this point in my life I am open to change, so I welcomed suggests on how to lead a life with less clutter and more simplistic approach to life. 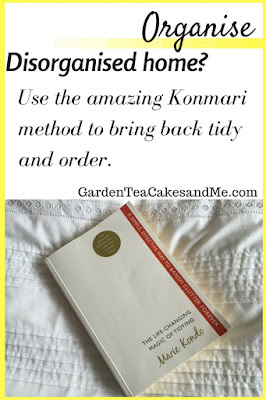 I think for this reason I really embraced this book and the Konmari method. I have been singing the praises of how this has changed me, and now even my sister has been tidying and folding. Yes there are certain times in the book when I did not connect with the passion Marie clearly feels about tidying, but there again tidying is her life. I now appreciate the items I have far more, but I won't be talking to my handbag or shoes any time soon. 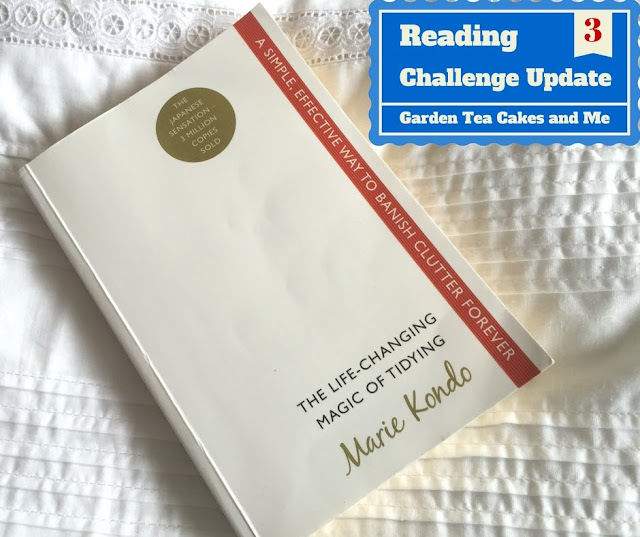 There is just one down side having read the book, I have been focused on decluttering I am 2 books behind on my reading challenge! I am off to open and gaze upon my beautifully folded cloths, I am not exaggerating. Honestly, I open a drawer and it brings a smile to my face. I scored this book 5/5 on Goodreads. Order the book now from Amazon and start a new clutter free life. Have you read any books that have had an impact on how you live? I tried this but I really couldn't get on with it. I appreciate a lot of what she said, but our problem is too many people (with associated stuff) in too small a space. I really want to read this book, but then I'm also slightly scared to in case I end up chucking all my stuff! Guess I'm not ready for it yet.